During a recent visit to Lurie Children’s Hospital in Chicago, Pau helped a few of the patients with Cystic Fibrosis tackle the challenge of adding physical activity into their treatment regimen. 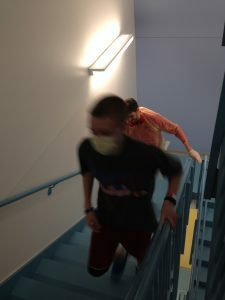 While visiting with one patient, Pau got more of a workout than he anticipated when the two decided to run flights of stairs together as a team! 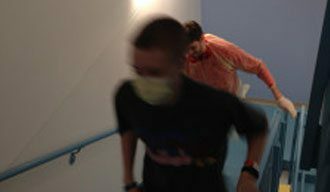 Pau running the stairs with a patient at Lurie. Lurie Children’s encourages those suffering from Cystic Fibrosis to integrate physical activity into their treatment and this unique opportunity had a huge impact on Logan, and helped motivate him to keep up with his physical activity regimen during his stay at the hospital. After catching his breath, Pau met with another Cystic Fibrosis patient. After speaking with the NBA star, the girl told Pau she was committed to increasing her amount of weekly exercise and that she planned to present her exercise goals to her medical team the next day.